Breed Group: Miscellaneous Weight: Male: 70-84; Female: 57-71 lbs Height: Male: 23.5; Female: 22 inches Color(s): Black or Gray Originating in Persia, the Bergamasco is an ancient shepherding breed. They were developed to be independent and intelligent. The Bergamasco breed nearly became extinct after World War II but was revived by Dr. Maria Andreoli, an Italian scientist and breeder. Bergamasco's remain relatively rare both in Italy and in North America. The most distinctive and unique feature of the Bergamasco breed is the coat. The Bergamasco's are heavy-boned and muscular. They are a true working breed that shows great dedication and seriousness to the job they are given. They are of medium-size, strong, and courageous. The Bergamasco is not recommended for inexperienced or first time dog owners. The Bergamasco is loyal, gentle, and highly protective of their family, home, and territory. They will do okay with other dogs that they do not perceive as a threat, and other pets they have been raised with. Bergamasco's are tolerant and patient with children. This breed is wary, distrustful, and disliking of strangers. They are always alert, attentive, sensible, dignified, and well-balanced. The Bergamasco was never intended to be solely a pet. The Bergamasco breed requires occasional brushing. The "cords" of the coat must be separated by hand and lightly brushed individually. Bathing should only be done when absolutely necessary as the Bergamasco takes an extremely long time to dry. Due to the rarity of this breed there are no known health issues or concerns. 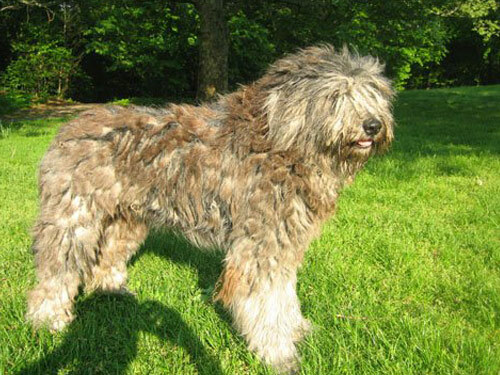 The Bergamasco coat consists of three different texture types of hair: wool, goat, and dog. These three combine into feltlike matting that "cord" and grow to reach the ground; completely covering this breed like a curtain. The coat serves as protection from predators and weather. Independent, intelligent, and free-thinking, the Bergamasco is not submissive. They were bred to solve problems on their own, and must know the "why's and wherefor's" of the commands they are given. Bergamasco's do not submit because of obedience, rather, they submit to display affection. This breed does not respond to harsh or heavy-handed training methods. Training must be done with respect, firmness, fairness, and consistency. Basic socialization and obedience is recommended. The Bergamasco is best suited for cold climates. They are not recommended for apartment or city dwelling. They do best in a rural setting with room to roam, being given a job to do, and playtime with their family.